That moment of silence for my iPhone was not mourning. I was just stunned. The sobbing, that was mourning. For three years now, since the first iPhones came out, Apple’s mobile meth has been at the heart of my innovation pitch. At the first Newspaper Next symposium in February 2006, Harvard scholar Clayton Christensen used phones as an example in explaining disruptive innovation. I understood instantly. At an intellectual level, I understood Christensen’s story of how Alexander Graham Bell’s original telephone disrupted Western Union and the telegraph business. At a personal level, I understood deeply Christensen’s story of how the original mobile phones – though barely good enough by such standard measures as reliability, audio quality, battery endurance and size – changed communication forever because they offered mobility. I flashed to my first story dictated on a brick-sized cell phone and the instant realization that reporting would never be the same (and I really had no idea). I knew I hadn’t bothered to get a landline when I moved to the Washington area in 2005. I was quite sure my youngest two sons had never had a home landline since they moved out of our house. I noted in N2 presentations that my Motorola Razr phone had become my alarm clock and my camera, in addition to my phone. I made mobile phones a central part of my innovation presentations for journalists and media executives. And then I got my first iPhone. It was summer of 2007, when the first models came out. I wasn’t wild about the AT&T coverage (that “good enough” standard still applied), but the touch screen and applications and email and browsing capabilities thrilled me. I had a better prop, not to mention a deeper passion, for my innovation presentations. Then I learned about Twitter and how easily the combination of mobile device and short-message platform helped me communicate with hundreds and even thousands of people instantly and effortlessly. When my first phone’s screen shattered on the bathroom floor, I quickly got another (the “genius” at the Apple store had to admit a phone ought to hold up to an 18-inch drop, so Apple replaced it). And when Apple came out with its 3G iPhone, Mimi knew what to get me the Christmas of 2008. By the fall of 2009, I was advocating a mobile-first strategy for news organizations. By January of 2010, I was co-teaching a class in developing an iPhone application. By February, I bailed out on the class to make the biggest career jump of my life, joining TBD to plan and execute a community engagement strategy that made heavy use of mobile opportunities. So of course I took my iPhone to the beach with me Saturday when Mimi and I visited Rehoboth Beach, Del. I had taken pictures on previous coastal visits to Monterey, Calif.; Tofino, B.C. ; Pescadero and Half Moon Bay, Calif.; Miami; Key Largo; Biloxi, Miss. ; St. Petersburg, Fla.; and lots of other places without beaches. Where I go, my iPhone goes. It’s not like I was going to be swimming in the ocean. Clearly on some level, I knew I should untether from my phone for the weekend (is this enough foreshadowing for you?). But sometimes I don’t listen to myself. As we walked Rehoboth Beach, I took a picture of the crowd on the beach and posted it to Twitpic. I didn’t have a really good opportunity to take a photo of Mimi. I thought I might do that in the evening or the next morning (I’ve taken some nice pre-iPhone sunrise photos over the Atlantic). After strolling along the edge of the water for a while, enjoying the waves splashing across our feet, we decided to sit down on our towels. That crowd I had photographed had grown a bit more and the only spot we could find to sit was about 8-10 feet past where the waves were splashing. Somehow as we sat down and relaxed, I set the phone down next to me on the towel. That’s when the tsunami hit. Well, OK, it was just a big wave. But it was a disaster for my iPhone. And, well, it went on at least twice that long, but you get the idea. Elaine Clisham (@eclisham above and a former colleague at the American Press Institute who was deeply jealous when I got my first iPhone and is still waiting until she can get one without AT&T service) calls me an Apple fanboy. This might be the place to say I have a love-hate relationship with Apple. I work with a bunch of Mac fanboys and fangirls and live with another, but I have never seen the attraction. I hate my current Mac (my third) as much as I hated the HP computer that preceded it and a Dell and a Gateway back in my computer past. Like every computer I have owned or been issued, the Mac taunts me daily with its (or my) inadequacies. For every Mac feature that I like, I curse at least one feature. And I really hate that it doesn’t play well with others. But the iPhone is a different matter. It changed my idle time in a big way. There’s the restroom (as long as I don’t drop it). Walking to a bus stop or a meeting is no longer merely walking. 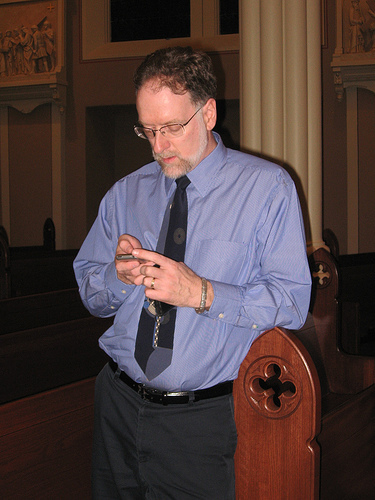 I’m checking email or tweets or tweeting (OK, occasionally bumping into someone or something, too). Waiting became a time to check and answer emails or surf the web. If a meeting starts late, I’m no longer annoyed; I’m catching up. If a flight leaves late, I’m annoyed, but I can tweet about it. In my previous job, I had both an iPhone and BlackBerry for a while because I couldn’t get my work email on the iPhone. It was no contest. As soon as our IT staff got my work email coming in on the iPhone, I jettisoned the BlackBerry. Don’t get me wrong. I love the Verizon commercials making fun of AT&T’s crappy coverage (and it is bad; I felt out of touch when I drove in rural Iowa). I love when people mock the sanctimonious Steve Jobs. I laughed at the Hitler mashup making fun of the iPad (I still don’t have one of those, though it may be coming; and sorry that I can’t include the Hitler link; it’s been removed from YouTube). I laughed at the antenna problems of the 4G and figured I’d wait a while to get one of those. I tweeted (from my laptop) last weekend about the scene in “Field of Dreams” where Shoeless Joe Jackson talks about men who scratch at missing legs that “have been dust for years.” That was me without my iPhone, reaching into my pocket again and again to check in to a restaurant or tweet an observation. Right now I’m hating Apple again while I wait to get my next iPhone (it’s been ordered). A company that cared about customers would have an adequate supply of phones in stock. But Apple cares more about the appearance of demand than about meeting demand. So I wait. Did you know that waterproof phones are popular in Japan? I wonder if the iPhone 4G comes in waterproof. I may find out soon. I’m assuming that once you get a new phone there will be a 21 tweet salute. Won’t take long to hit 21. I once watched a (bombed) woman fetch her drowned phone out of a porta-potty at a concert. Sad, sad moment. Would be interesting to know if her phone fared any better than mine. Pardon this geek moment, but a colleague of mine has reported that, following an unsuccessful fishing trip made even worse by a fall off a dock at the end of the day, becoming doused and, as misfortune would have it, taking his HTC Fuse (running Windows Mobile 6) with him, he was able to resurrect it. He told me that, by removing the battery, carefully removing parts of the back cover that were accessible, and drying all components with a hair dryer, the device was brought back to life, working just as well as it ever had. After he finished his tale, I offered that I would have left the Fuse in the water and would have replaced it with an iPhone. Thanks for the shout-out, Steve. I hope to never live through the pain of losing a phone to a natural body of water. Well, I speak too soon – I once ran into the Red Sea with a rental phone in my board short’s pocket. That didn’t turn out so well for the phone, or the rental company. Try the AT&T store. I was on the Apple waiting list and thought I would check out the AT&T store while visiting the mall a couple of weeks back. Sure, they had them. iPhone 4 and out the door in about 10 minutes.